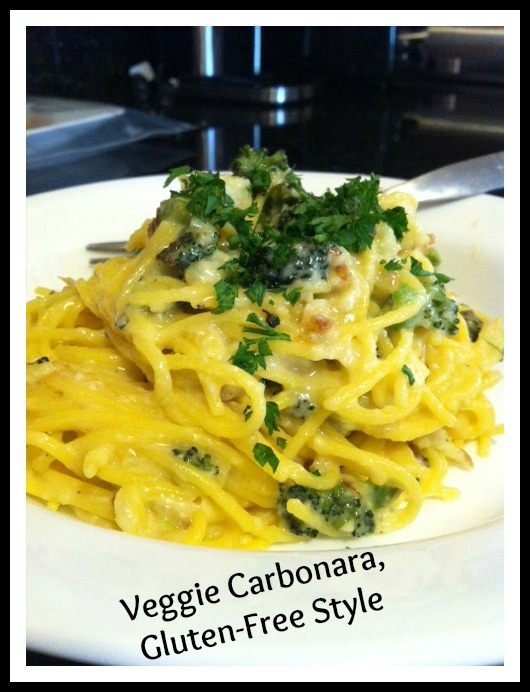 I see Pasta Carbonara recipes on the cooking channels all the time. They look wonderful, creamy, yummy. It just always seemed complicated or too tricky. And, I don’t eat bacon, of course. But, that didn’t stop me from giving it a try and finding a fantastic, quick ,and decadent dinner. Trust me, it sounds strange if you haven’t tried it, or if you are a meat-eater and want to add bacon, go right ahead. I don’t think it’s missing anything without the bacon. The Parmesan gives it a salty, creamy texture and the eggs add a bit of protein and a hearty flavor. I used spaghetti, but go ahead and try it with penne or even fusilli if you like. I know I’ll be making this again since it’s so easy and comforting. 1. Fill a pot with water and bring to a boil. When it comes to a boil, salt the water and add the pasta, cooking for 8 minutes (or whatever the instructions are for the pasta you are using). 2. While the pasta is cooking, add olive oil to a sauté pan and add cauliflower and broccoli. Add a bit of salt and sauté until brown and softening. Set aside. 3. In a separate bowl, add eggs, half & half and most of the Parmesan and mix well with a fork. Add a pinch of salt/pepper. 4. Drain the pasta, reserving a bit of the water in case you need to soften up the sauce. 5. Here’s the important part—take the saute pan off the heat and then add the drained pasta to the pan. Coat with the oil in the pan, and then add the egg mixture, tossing to get all the noodles coated. The sauce will thicken up as the eggs set, but as long as it’s off the heat you won’t have scrambled eggs instead. If it’s too thick, just add a little bit of the reserved cooking water to thin it out. 6. Top with a bit more Parmesan if you like, and the chopped fresh parsley. If you don’t have broccoli and cauliflower in your fridge (I had a small bag of mixed), go ahead and use zucchini or even sauté some carrots. The veggies don’t matter, you can even leave them out and just make it plain. You probably have a couple of eggs and a bit of half & half in the fridge. That really all you need, along with Parmesan and pasta. Be creative. I’m so glad gf pastas are getting so good -definitely craving some now! So true! I remember when I just didn’t eat pasta because the GF versions just weren’t worth it. Now, it’s fantastic! Enjoy your pasta!